Only one photo tagged with Blenheim. If you have one, why not upload it? Two sites located between junctions, with no public connection between them. 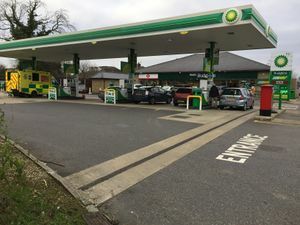 A pair of petrol stations in Yarnton. The eastbound Shell isn't signposted, but the westbound BP is an official services. The westbound side opened in the 1950s, and eastbound 1960s. Eastbound is operated by Majid and Sonswebsite while westbound is operated by Fraser's Retail, officially calling it Fraser's of Yarnton. The westbound side was a Gulf and Londis Express site which once included Lavazza coffee. The Blenheim name is a reference to Blenheim Palace, four miles up the road.